"The assertion that NBC News tried to kill the Weinstein story while Ronan Farrow was at NBC News, or even more ludicrously, after he left NBC News, is an outright lie." 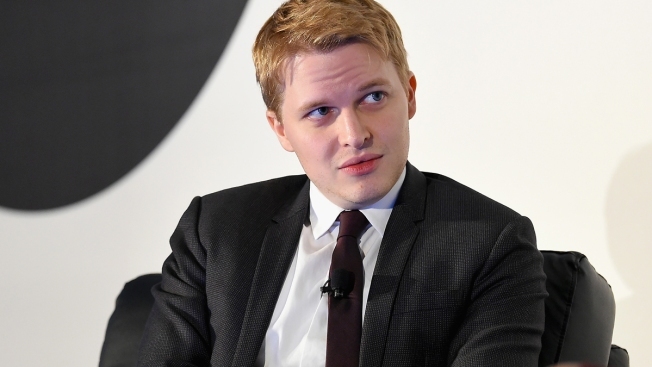 This Feb. 6, 2018, file photo shows Ronan Farrow speak on stage at the American Magazine Media Conference in New York City. NBC News has denied accusations by one of its former producers that the network blocked investigative reporting about a series of sexual harassment claims against media mogul Harvey Weinstein. The former producer, Rich McHugh, who had worked with writer Ronan Farrow on a story detailing accusations against the Hollywood film producer, told The New York Times that Farrow was ordered to stop work on the investigation. According to the Times article, published late Thursday, McHugh said the handling of the matter was "a massive breach of journalistic integrity," and that the order to end filming came from "the very highest levels of NBC." McHugh left the network earlier this month. NBC News disputes McHugh's comments, saying in a statement, "The assertion that NBC News tried to kill the Weinstein story while Ronan Farrow was at NBC News, or even more ludicrously, after he left NBC News, is an outright lie." NBC News says it disagreed because Farrow "did not yet have a single victim of — or witness to — misconduct by Weinstein who was willing to be identified." Dissatisfied with that decision, Farrow chose to leave for a print outlet that he said was willing to publish immediately, according to an NBC spokesperson. Farrow did not respond to an NBC News request for comment.